Published: Thursday, July 21, 2011 at 6:01 p.m.
Last Modified: Thursday, July 21, 2011 at 6:01 p.m.
On Tuesday, the state Wildlife Conservation Board has the opportunity to help secure a new vision for forest management for coastal Northern California by funding a conservation easement for the Usal Forest. After 20 years of division and mistrust, the core of our region's dialogue around timber issues has changed. With the worst of the past behind us, our community is ready to support a new vision of an ecologically and economically sustainable future for the region's redwood forests. There is no better example of this new paradigm than the Redwood Forest Foundation Inc. The foundation is an organization that brings together loggers, environmentalists, foresters, community activists and business leaders to acquire, protect and restore working forestlands for the ongoing benefit of all residents. The Redwood Forest Foundation's innovative model of community forestry provides jobs and lumber while protecting valuable fish and wildlife habitat. Most notably, this model will reinvest future net revenues back into the community. 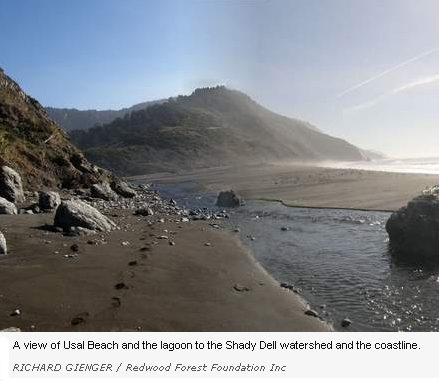 In 2007, the Redwood Forest Foundation purchased the Usal Forest, 50,000 acres of cut-over timberland on the Mendocino coast bordering Humboldt County. To protect these lands as a working forest in perpetuity, the foundation is seeking to sell a conservation easement, which would prevent forest loss to fragmentation. It is difficult to imagine a better application of Proposition 84 funds than the Usal Forest. This project is such a perfect match for these funds that it has received unprecedented support from across the North Coast, including the unanimous support of both the Mendocino and Humboldt County boards of supervisors, as well as the cities of Fort Bragg, Ukiah and Willits. Rep. Mike Thompson, D-St. Helena, state Sen. Noreen Evans, D-Santa Rosa, and Assemblyman Wesley Chesbro, D-Arcata, have joined hundreds of local voices to affirm support for this conservation easement funding. The Redwood Forest Foundation has worked openly and diligently with the Wildlife Conservation Board, subjecting this project to rigorous scrutiny and the state's highest standard of review. That process has served to reaffirm and validate the essential value of this project, ensuring that the state's bond revenues are being invested wisely. By seeking this easement now, rather than waiting until forest fragmentation is imminent, the Redwood Forest Foundation is able to secure maximum value for the state, providing greater conservation value dollar-per-dollar than many projects that the Wildlife Conservation Board has considered. The Usal Forest project embodies the essence of the Proposition 84 mission and has met all review requirements. Perhaps most important, this project will help to solidify the trust and goodwill that we have all worked so hard to repair after decades of entrenched battles over these fragile and beleaguered forests. We hope that the Wildlife Conservation Board will choose to stand with our region's efforts to shape our own Redwood Future. Mark Lovelace is chairman of the Humboldt County Board of Supervisors. Kendall Smith is chairwoman of the Mendocino County Board of Supervisors.